We offer Fruit Salad Areca Leaf Plates. Various color and sizes avaiable. We offer platters in hammered finish that are extensively used for snacks, salads, pasta serving, condiments in restaurant. 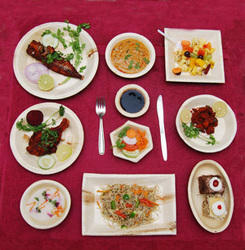 Bigger sizes are also available for food display & presentation. Eco Friendly Salad Plates are made from naturally fallen leaves of Palm Tree (Areca) Earth Friendly / Renewable / Sustainable / 100% Natural. We offer different Crockery items that are manufactured as per the international quality standards.The superior quality of king trays and we are manufacturing these products with the best quality of raw materials. 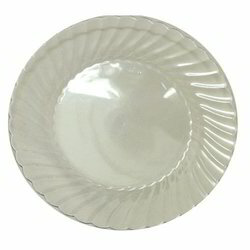 We offer Plastic Plate for Salad for salad in different shapes such as oval, round, rectangular.